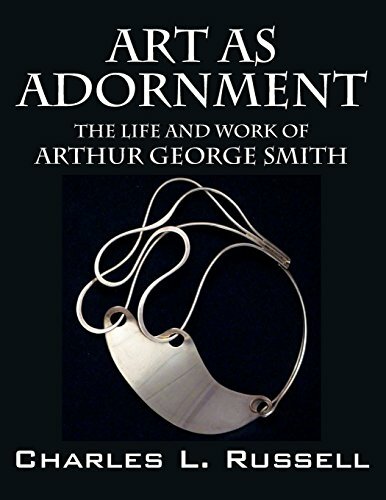 “Art as Adornment: The Life and Work of Arthur George Smith” by Charles L. Russell is not just a book about art; it is a testament of a life that left a mark in jewelry art and art history. The book is organized in two parts with few chapters within each part. It has a big collection of beautiful pictures not only of Arthur George Smith’s jewelry but also personal pictures of Arthur and his family and friends. Although this book can be an awesome resource for art students or enthusiasts, I loved that this is not limited to a biography. This book is the story of an amazing artist, a life, and a piece of history, which includes his art. It is an excellent resource about the making of a successful artist and his legacy. Charles L. Russell’s love for the artist and his work is evident starting with the foreword. Although he chose narrative to share Arthur George Smith’s life and work, the writing style, pictures, and book format flows and entertains while delivering detailed information about his art and technique. My only issue with the book is that because of the wonderful work, I would have loved it in a hard cover and a format that could be displayed as a conversation piece on a coffee table. Overall, I found “Art as Adornment: The Life and Work of Arthur George Smith” by Charles L. Russell a lovely book to have in a library, an awesome resource book for an artist, and a piece of history to be read, shared, and displayed. It will definitely make an awesome gift!